Dear Friends and Collectors, the Team of Collectors & Le Vernissage Galleries is proud to share with you the following news published by the Ministry of Diaspora of the Republic of Armenia on their website http://www.mindiaspora.am/en/News/4285. On November 4, Armenian American poet Tamara Hovhannisyan presented her book “I Am a Woman, An Island” with the support of the RA Ministry of Diaspora. This book is the Russian version of poems selected from the poet’s two previous collections. Among those attending the presentation were RA Minister of Diaspora Hranush Hakobyan, RA Deputy Minister of Diaspora Serzh Srapionyan, composer Robert Amirkhanyan, literary critic David Gasparyan, writer and publicist Yervant Azadian and others. 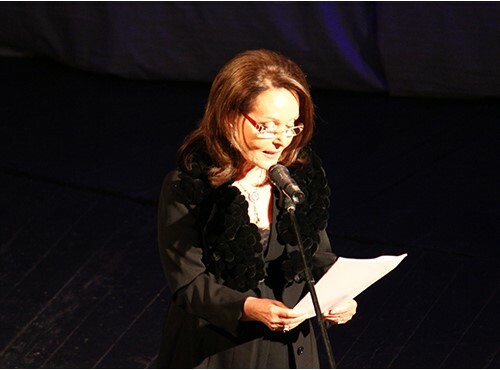 The deputy minister added that in her works the poet reveals the inner world of a woman, the enigmatic, exquisite and very mysterious essence where the image of a real Armenian woman and the “symphony of existence” of an Armenian woman unquestionably come first. “Tamara Hovhannisyan has been gradually establishing her presence among Armenian intellectuals over the past couple of years. Composer Robert Amirkhanyan also expressed his opinion on and shared his impressions of the book. Sergush Babayan recited a poem during the event.